Shirts With Random Triangles: Alabama running back T.J. Yeldon praised by Heisman winner Eddie George. 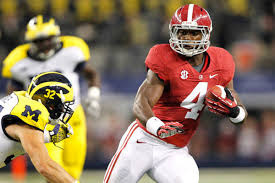 Alabama running back T.J. Yeldon praised by Heisman winner Eddie George. Is that a Heisman pose, T.J. Yeldon? Former Ohio State and Tennessee Titans running back Eddie George recently took in an Alabama fall practice in Tuscaloosa. The 1995 Heisman Trophy winner and member of the Titans' Super Bowl XXXIV team had high praise for Crimson Tide sophomore RB T.J. Yeldon. "It was wild to see him have so much success early but really gain his confidence throughout the year," George said in an interview with AL.com on Tuesday. "Now he comes in this season knowing that he's going to be the guy. The sky's the limit." George, who currently hosts a program on SiriusXM's College Sports Nation channel, also said that Yeldon "has all the ability. He can use the power game, he can be very elusive inside the tackles, he's tough to bring down, excellent speed outside the tackle box, can break the home run for you." If Yeldon is as good as George believes him to be, then Alabama starting quarterback and 2013 Heisman hopeful A.J. McCarron may have some competition for the trophy on his own team this season.